Located at Preston market in the food section, you can't miss Calavera. It's on a corner with distinct concrete decorative bricks from the 70's and you can't miss the day of the dead skull logo from Melba tea and coffee. The market has the usual pizza slices, gozleme, Chinese food and hot jam donuts. Food that's quick and convenient, however not that good for you. We stumbled upon Calavera for a quick coffee fix whilst waiting to collect some signage, so great opportunity to stop and have lunch. After walking around trying to find something healthy, we stumbled across Calavera. 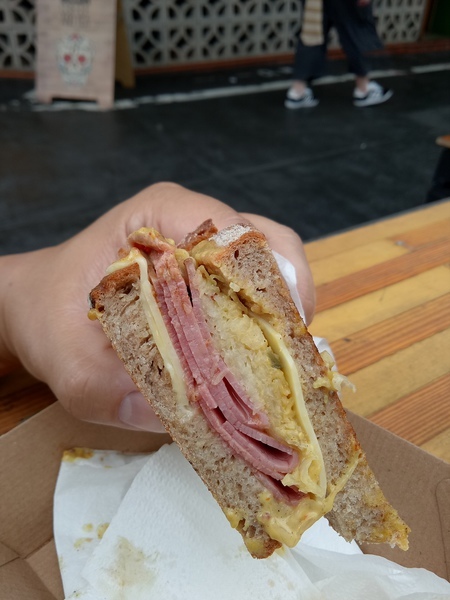 My partner ordered the Reuben sandwich, which he thought was the tastiest sandwich he has had forl long time. It looked pretty delicious, however as a vegetarian I stuck with a date slice and coconut water!